I've looked this up and it says something about the observer's co-latitude. However, I do not understand why this is the case. Could someone explain this please? Perhaps you have heard that the altitude of the celestial pole (3 in the figure below) is equal to your latitude. In other words, angle 5 is the same as your latitude. Of course, the angle between the celestial pole (3) and the celestial equator (4) is 90 degrees (angle 6). 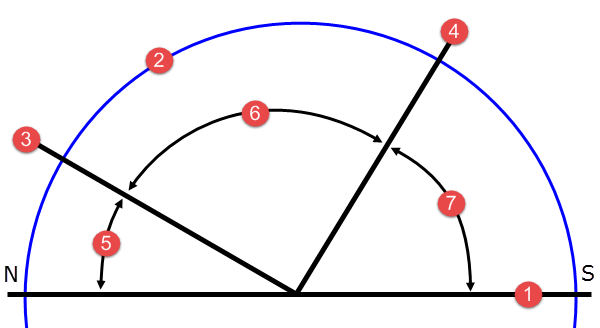 From this, you should be able to calculate the angle of the equator (angle 7). Item 1 is the horizon, and 2 is the celestial sphere. I've always found it useful to answer this type of question by considering extremes. If you're at the equator ($0$ latitude), where is the Celestial equator? If you're at the Pole ($90$ latitude), where, the Celestial equator? As you move each degree from equator to pole, what happens to the elevation of the equator, and how fast? Not the answer you're looking for? Browse other questions tagged earth or ask your own question. How did the Earth come to be in orbit around the sun? Why is right ascension measured on a 24 hour scale rather than a 23 hours and 56 minutes scale?